On April 28th, 2018, the ribbon cutting for the new Chicago Filmmakers home took place, at 5720 North Ridge Avenue on the north side of the Windy City. Many dignitaries were present, including Alderman Harry Osterman, who represented the City of Chicago in the project, Chicago Film Office Director Rich Moskal, Illinois Film Office Director Christine Dudley and prominent local actor/star of “Chicago Fire,” Christian Stolte. They were joined by Chicago Filmmakers officials, including Board President Sharon Zurek and Executive Director Brenda Webb. Chicago Filmmakers is a not-for-profit media arts organization that fosters the creation, appreciation, and understanding of film/video as media for artistic and personal expression, as well as media of important social and community impact. Their twofold mission is to serve independent film and digital video artists by supporting the creation and dissemination of new media arts works, in addition to serving Chicago audiences by screening artistically innovative, socially relevant and diverse films/videos. An offshoot of Chicago Filmmakers began in 1973, and was incorporated under its current name in 1976. Over the years, it has been at various locations around the city, most recently in the Andersonville neighborhood on Clark Street. 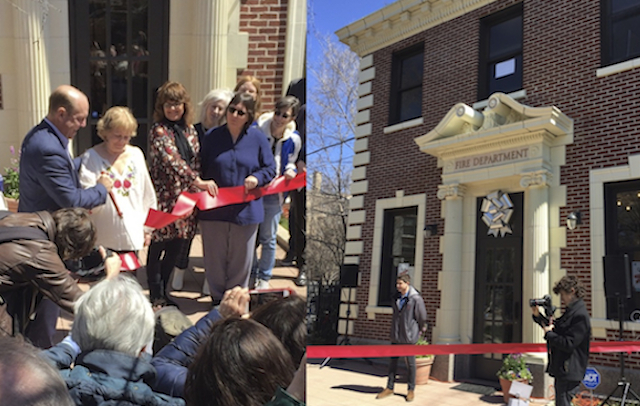 The firehouse conversion to a more permanent home was a five year collaboration between the organization, donors and the City of Chicago. Ana Wright has been the Programs Manager at Chicago Filmmakers since August of 2017. In the following Podtalk, Ana Wright outlines the effort it took to establish the new home of Chicago Filmmakers, and the potential for the community of Chicago cinema creators and the community at large. For more information about Chicago Filmmakers, their screening/classes offerings and their new location, click here.